"And the young man replied, his gaze never wavering, 'I see the place where the wings join the body.' And the shaft went straight--and the vulture fell." Dr. Jernigan, referring to the National Federation of the Blind throughout his banquet address, said, "A vulture sits in the branches of a dead tree, and we see the place where the wings join the body." His message was clear: as members of the NFB we must keep sight of our vision of the future and not become distracted from our true purpose. With this in mind, as the newly elected President of the NFB of Arizona, I decided that, in order to capitalize on the strength of past leadership in the state and help our affiliate reach new heights, it was important that we be united in our understanding of the purpose of the NFB and of basic leadership principles. Additionally it is important that we set goals and organize ourselves to reach those goals. Therefore our first Board meeting following our state convention was dedicated entirely to these topics. All members of the affiliate were encouraged to attend. I have now been asked to share my notes of that meeting with other Federationists. With the addition of some further thoughts, here is what we discussed: (1) What Is the NFB and What Is Its Purpose? (2) Leadership in the NFB; (3) Goals and Objectives; and (4) Specific Committee Assignments. What Is the NFB and What Is Its Purpose? 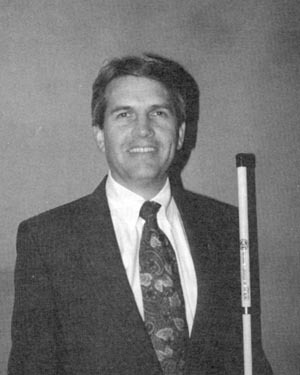 What is the National Federation of the Blind? In order to understand the NFB properly, we must recognize that it consists of two parts: an organization and a philosophy. The organization is made up of blind people working with and for blind people. That is significant. However, without the philosophy the organization would not be much different from the ACB or, for that matter, the Lions Club or dozens of other organizations. Without the philosophy it would simply be another group of volunteers who have come together for the common purpose of doing good. Fortunately, the NFB is not just another blind organization--it has a philosophy. * That blind people are normal people--simply a cross section of society--who just happen to be blind. * Given real opportunity and effective training, the average blind person can do the average job in the average place of business as well as his sighted neighbor and can participate fully in the affairs of family, community, and nation. * The real problem of blindness is not the lack of eyesight (because there are alternative ways to do what you would have done with eyesight if you had it), but the public's (and often the blind person's) attitude about blindness. * With real opportunity and effective training, blindness can be reduced to the level of a nuisance. In other words, NFB philosophy is nothing more or less than the truth about blindness. It is not speculation, wishful thinking, or fantasy. Tens of thousands of NFB members over the last fifty-nine years have proven the truth of this philosophy. Unfortunately, the truth is not widely known, and misconceptions about blindness abound. However, the truth is no less true for its relative obscurity, but rather more valuable. * He must know the truth about blindness--that is, he must come emotionally as well as intellectually to believe that he can be truly independent and live a productive, normal life. It is much easier to learn the truth intellectually than it is emotionally, but the emotional belief is key. * He must acquire competence in the alternative skills which enable a blind individual to be truly independent. These are skills such as Braille, independent travel, and personal management. * He must develop a complete understanding of public attitudes about blindness and why those negative attitudes are what they are. And he must get to the point where society's attitudes (and the things which will happen because of those negative attitudes) do not bother or upset him so that emotions do not get in the way of success. You can't do what you need to do when you lose your temper. How can the NFB fulfill its purpose of helping as many blind people as possible to become successful? Once we understand the NFB's overall structure, philosophy, and purpose and once we understand the three ingredients which it takes for a blind individual to be truly successful, we can more easily envision how the NFB can fulfill its purpose. I believe it can do this by focusing its efforts in the three areas that constitute our three-fold mission. They are sharing our philosophy (the truth) about blindness, strengthening our members, and advocating for the blind. * Sharing the philosophy: Although we of the NFB know the truth about blindness, we gain nothing by keeping it secret; it must be shared. Our first responsibility is to share it with blind people who do not know the truth about blindness or about the NFB. As we have already discussed, a critical need of any blind person is to come to believe the truth emotionally. Since we know it, we have a moral obligation to pass it on to others. Second, we must share the truth with the general public. We of the NFB are seeking the complete integration of the blind into society, and in order for us to accomplish this objective, the general public must become aware of the normality and capabilities of the blind so that they can accept blind people and make a place for us once we have been trained and have emotionally accepted our own blindness. * Strengthening our members: The members of the NFB are at different stages of development--society is continually eroding our understanding of and commitment to the truth about blindness. Therefore it would be as foolish to assume that a member of the NFB needs no additional philosophical help and support as it would be for a good Christian to assume that, because he read the Bible fifteen or twenty years ago, he does not need to read and study it any more. We should be constantly working to develop a deeper intellectual and emotional understanding of the truth about our blindness. Therefore we must constantly strengthen our own members. * Advocating for the blind: Our third broad mission is advocacy. We must advocate for the protection of civil rights, for quality educational programs for our blind children, and for quality rehabilitation services for blind adults. This involves state and national legislation, grievances, hearings, and demonstrations. Everything we do in the NFB should fulfill one or more of these major objectives or be a supporting activity (such as fund raising) which leads to successful implementation of these three major objectives. Overemphasis on one of these objectives will result in insufficient emphasis on another. The NFB strives for a balanced approach to fulfill its three-fold mission. In the management of any business or governmental or private organization there are four basic styles of leadership, which are helpful to understand. First, there is the command style. In this the administrator makes the decisions and tells others what will be done and who will do it. Second is the input or counsel style. Here, after receiving input from others, the leader makes the decisions and announces them to others. Third is the democratic style. Here, the leader allows a majority vote to rule. And fourth is the consensus style. In this one the leader continues the discussion until all agree upon a plan--possibly a plan which was no individual's first or second choice, but something everyone can live with. In an organization such as the NFB, each of these four styles is appropriate at different times, depending upon the circumstances and issues involved. It is generally understood that the consensus and democratic styles are effective in building unity, team spirit, and membership support. However, the more critical, far-reaching, or visionary the decision must be, the less effective the consensus or even the democratic style is likely to be. The role of a true leader is to have a vision of where the organization needs to go and the ability to employ a combination of the various leadership styles to make the vision a reality. Three old adages can be instructive in illustrating the need for a mentoring approach to leadership in the NFB. (1) "A lazy mother does everything for her children." (2) "If you give a man a fish, you feed him for a day. If you teach him how to fish, you feed him for a lifetime." And (3) "He who can do the work of ten men is great. But he who can get ten men to work is greater." In the NFB leaders must be mentors. We must be willing to set the example and say, "Come, follow me," but we must also make sure that we strive to enrich and empower others to learn to do for themselves and to do their share of the organizational work. It is inappropriate for the elected leaders to think that it is their responsibility to do all of the work. Also it is important for us to tap all of the resources which we have available in the organization, and we must help all of our members develop their talents and potential (even when they think they don't have any) by giving each of them the opportunity to serve in some capacity in the organization. NFB leaders must delegate, spread the work, mentor, and follow up because members need to experience and live the philosophy, not just hear it. When a chapter or state affiliate is setting its goals and objectives for the coming year, conducting a brain-storming session with members can be very helpful. It is important to keep in mind the mentoring approach to leadership and the four leadership styles and to remember that our ultimate objective is to assist blind people. We should also keep in mind the three-fold mission of the NFB as we make our plans. The major 1996 goals and objectives for the NFB of Arizona are 1) establishing NEWSLINE(R); 2) getting a large Arizona attendance at the 1996 National Convention in Anaheim; 3) putting on a major fiftieth-anniversary state convention in September; and 4) strengthening our own members and the NFB of Arizona so that we can help more blind people be successful and also have more legislative clout. Once we understand the organization, its philosophy, the three things which every blind person needs in order to be successful, and the three-fold mission of the NFB, our work and the committees needed to do the work can be clearly envisioned. Most of the committees fall directly under the three main purposes, and several others support the basic mission. Public Relations Committee: one major effort must be to reach the public effectively through the media. This includes airing radio and television spot announcements about the NFB, broadcasting our films on television, and placing articles and stories about the Federation in the print media. Public Speaking Committee: Members of this committee give speeches at schools, civic organizations, employment or church groups, and teachers' or parent groups. This committee should prepare white papers to help rank-and-file members make effective presentations. The committee also conducts training sessions in successful public speaking. Dissemination of Publications Committee: This committee sees that our literature--"Do You Know A Blind Person?" "What Is the National Federation of the Blind," If Blindness Comes, etc.--gets into the hands of the public. We can also create our own local and state informational materials. All these materials should be placed in doctors' offices, libraries, bank lobbies, utility-company mailings, etc. Information and Referral Committee: This committee will handle the NFB of Arizona's telephone message machines, return calls, make appropriate referrals, and identify potential new members. New Member Mentoring Committee: Once we have identified new blind people, we must have a way of retaining information about them so that they do not inadvertently slip away, and we must have a mechanism to communicate the truth about blindness to them. Whenever possible, the one-on-one approach is best. Give them copies of banquet addresses. Talk about their experience with blindness. Invite them to dinner. This committee should prepare new-member packets and assign an experienced mentor to each new contact. NEWSLINE(R) Committee: This committee's task is to obtain the financial and public support necessary to make NEWSLINE(R) a reality in Arizona. Although NEWSLINE(R) will greatly benefit our own members, it is mentioned here under Spreading the Philosophy because establishing NEWSLINE(R) will require extensive outreach into the community. Philosophy Committee: This committee has two primary functions. First, it will conduct a statewide philosophy seminar at least once each year. Second, it will work steadily with local chapters to develop ways to get members to read and study NFB literature--banquet speeches, Federation periodicals, Kernel Books, Walking Alone and Marching Together, etc. One possible approach is to establish a contest with points and prizes for those who read NFB literature. Each chapter meeting should contain philosophical meat--substantive discussion about what distinguishes us from other organizations. Telephone Committee: The state affiliate must help chapters and members stay well informed about NFB issues and develop a strong network of close relationships. This committee must get the word out quickly. Each chapter is encouraged to develop a similar plan so that information flows quickly and accurately throughout the organization. New-Chapter-Organizing Committee: As we learn of new areas where organizing can be done or as existing chapters get so large that they should be split up into smaller geographic areas, this committee will be available to spearhead the work. National Convention Arrangements Committee: One of the most important things we can do to strengthen our members is to get them to National Conventions. This committee has two main functions: to work out the logistics of getting members to the National Convention and to work with the Philosophy and other committees to help motivate and inspire members to want to go. Convention-Planning Committee: This committee has one function each year: responsibility for organizing the state convention--finding the site; choosing the dates; and negotiating the rates for rooms, meals, equipment, etc. During anniversary years the committee should also plan special activities and programs. Braille Literacy Training for Adults Committee: This committee will participate in the Braille Literacy Training Project established by our national organization. The project matches Braille-using mentors with adults wishing to learn Braille and assists the mentors in their teaching. Awards Committee: This committee identifies candidates for the affiliate's special merit awards, makes selections, arranges for plaques, etc. Scholarship Committee: This committee circulates state scholarship applications, reviews candidates, makes selections, and arranges for the winners to attend and participate in the state convention. National Legislation Committee: This committee works with the National Office on needed action, contacts chapters or individuals to notify them of needed action, and participates in the annual Washington Seminar. State Legislation Committee: This committee works on all facets of state legislation and plans and coordinates annual legislative events. Grievance Advocate: The advocate handles complaints, grievances, and hearings involving problems blind people are having with either state or federal agency programs. Governor's Council on Blindness: The NFB of Arizona holds three positions on the Arizona Governor's Council on Blindness and Visual Impairment. These three individuals represent the NFB of Arizona at Council meetings, advocate for NFB of Arizona positions, and remain vigilant to make certain that the Council does not take positions or actions harmful to the blind community. Materials Inventory Coordinators: Just as modern business practice requires just-in-time inventory, we need to have the materials available from our National Office closer to home. Our state coordinators should have commonly requested and needed items on hand so that local members and committees don't have to keep their own stock pile of materials or contact Baltimore each time something is needed. The coordinators might also keep a few canes, cane tips, and other aids and appliances on hand. Fund-Raising Committee: This committee will deal with two broad areas--preparing grant applications and traditional fund-raising projects such as walk-a-thons, yard sales, or other new projects through which our own members can help to raise funds for the organization. Newsletter: This committee is responsible for writing and editing the state newsletter, gathering information from chapters and divisions, and producing and distributing the final product. Computer Committee: This committee keeps track of membership and other computer lists, prepares mailing labels, and carries out similar organizational duties. PAC, Associates, and SUN Committee: The chairman of this committee is responsible not only for reporting on the affiliate's rank in these National fund-raising programs, but also for devising ways of encouraging broader participation from all members of the affiliate. Do we expect to staff all of these committees immediately and have them functioning efficiently? No. We do not intend to run faster than we are able or to take on so many things at once that we cannot do anything well. We know implementing this plan will take time, but we have a vision of how the NFB can and will operate in Arizona. "A vulture sits in the branches of a dead tree, and we see the place where the wings join the body."